After hours of watching t.v., you force yourself to rise from the couch and use the restroom. Next you walk into the kitchen and grab something to eat. When the phone rings, you walk over to it and pick it up. 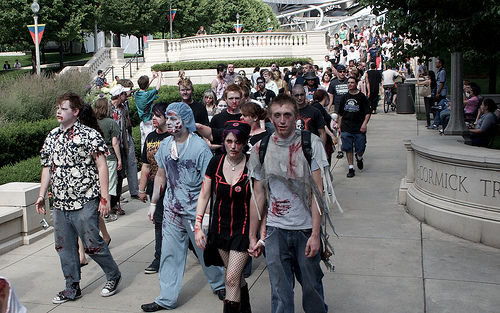 Or perhaps you gather dozens of your zombie friends and march through the streets of Chicago. You know. Just another ordinary day. My point is this: While walking is something most of us do on a daily basis, few of us think of it as one of our hobbies. In fact, most of us are what you might call walking zombies. We walk mindlessly from one task to the next without ever thinking about what it is we’re doing. But walking is more than just a way to get around. Buddhists, for instance, practice something called Walking Meditation. Walking meditation is a good way to begin shedding those figurative zombie walking boots because it allows you to slow down and notice each small movement. Pay attention to each foot as it touches the ground and you’ll begin to appreciate the smaller things in life–like your body, and all it is capable of doing. 1) As mentioned, walking meditation is a great way to begin slowing down and appreciating the art of walking. 2) Nature walks, like walking meditation, allow you to slow down. Walk slowly through a forest. Walk on the beach. Stop and smell the roses for once–and yes, I mean literally stop and smell the roses. 3) Often. Save gas and walk to the grocery store instead of driving. You’ll be surprised what you never noticed about your own neighborhood! 4) with Love. Walk with someone you love. Have good conversations and enjoy the company of friends. But also, walk with love. Say hello to strangers and neighbors who pass by. 5) with Intent Walk because you want to lose weight. Walk because you want to see what’s in your refrigerator. Whatever your reason, walk with a purpose in mind! 6) …Like a Zombie! This may surprise you, but one of the ways to stop walking like a zombie–is to start walking like a zombie! Participate in a zombie walk, particularly one which emphasizes charity and community service. Its great to have such a website. Will you please provide more details about the hobbies! Wow! Great post. After reading this post, I now feel like going for regular walks every morning. Thanks. Niezwykle bombowy wpis. W wolnej chwili zajrzyj na: buty zimowe dzieci?ce. HMhtWz This very blog is really educating as well as factual. I have found a lot of useful stuff out of it. I ad love to come back again soon. Thanks!